Vale of Glamorgan Council should take responsibility for its school funding, Wales' first minister has said. The authority says it gets £600 less per pupil than the average from ministers, as a row was sparked by some schools saying they would consider closing early on Fridays to save money. 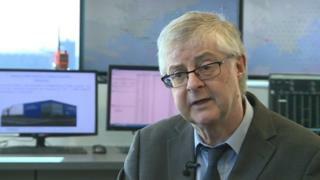 Mark Drakeford said it was a matter for the authority to sort out. Council leader John Thomas claimed the Welsh Government cared less about pupils in the Vale than other areas. Head teachers at Penarth schools have written to parents saying colleagues are taking on weekend cleaning duties so school buildings can be hired out to raise money. They also warned they were being forced to consider Friday afternoon closures to "create a sustainable staffing model". Mr Drakeford criticised the Conservative-led council in an interview ahead of the Welsh Labour party conference on Saturday. "It's not clear to me why the Vale of Glamorgan uniquely feels it is unable to manage to provide an education for its children on a Friday," he said. "That is a question for them, which they must be prepared to answer. "We have provided record levels of investment for education. "We have paid in full the uplift in teachers pay. We have paid in full the uplift in teachers pensions," he said. "Other education authorities in Wales have been able to manage their funding in a way that has not led them to the crisis that the Vale of Glamorgan appears to believe it is in. "It is for them to resolve it and not for them to pretend that they are not in charge of the services for which they have full and democratic responsibility." The council has said it spends about £4m more on schools than the Welsh Government says it should do in order to keep them running. But the Welsh Government has claimed that Vale of Glamorgan spends the least per pupil of any local authority in the whole of Wales. Image caption Jeremy Miles: "If I talk to colleagues across Wales delivering services, absolutely they're under pressure"
Funding for schools comes from councils, which get the majority of their cash from the Welsh Government, itself mostly funded by a UK government grant. Council leader John Thomas said: "We have never once suggested we are not able to manage our own services nor have we sought to make the issue of funding education a political one. "This is not a political issue, it's a geographical one. The first minister's comments are misleading", he said. "If he has no intention of addressing this then it is about time the first minister acknowledged he and his government care less about pupils in the Vale than those from other parts of the country." Earlier, Brexit Minister Jeremy Miles said the Welsh Government had done all it could to defend "front-line services" despite "deep cuts" imposed by UK ministers, amounting to £880m less to spend in Wales this year. He said Labour recognised that people were under "significant pressure" in delivering public services for Wales, but a Welsh Labour government under devolution had been able to "prioritise those diminishing resources". The minister argued the "situation would be even worse" if Labour was not leading the devolved government in Wales.